Chocolate is my favorite sweet indulgence. Really. And not just chocolate. Dark chocolate. I dislike milk chocolate. And white chocolate is…not really chocolate. Dark chocolate. That’s where it is for me. I love that bittersweet, rich, deep flavor that dark chocolate offers up. I love how it literally will coat my taste buds and I will just let anything dark chocolate melt slowly. It makes the indulgence last even longer. A while back, my roommate picked up a few Dark Chocolate Dream chocolate bars from the local grocery store. They were on closeout, so in a panic we bought pretty much one of everything. I tucked these away in a drawer and forgot all about them…until recently. So, now I’ve been working my way through these chocolate treats…before they expire and all that good stuff. I’ve been given a plan by sports nutritionist to move toward a clean eating diet. And while most would not consider chocolate to fit into that…I like to point out the health benefits of dark chocolate. It’s good for your heart because it has been shown it can help lower blood pressure. It helps improve cognitive function in your brain by increasing blood flow to your brain. In fact…it’s been shown to help reduce the risk of stroke. It’s a mood booster. It is full of antioxidants. Oh, and dark chocolate has high concentrations of potassium, copper, magnesium, and iron. NICE! So this week, the drawer held a couple of choices, but I opted for the Dark Chocolate Dream Rice Crunch Chocolate Bar. Why? Well…while I did enjoy the Enjoy Life’s Boom CHOCO Boom Ricemilk Crunch was good and filled with the crunchy rice bits for that added oomph…it sort of had this chalkiness to it. 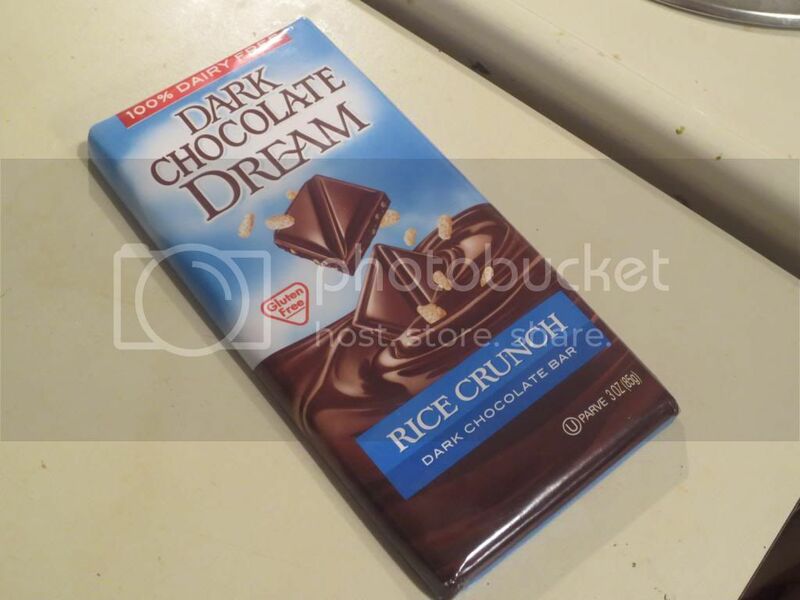 Dark Chocolate Dreams Rice Crunch Chocolate Bar does offer up a better alternative. Honestly. While the puffed rice isn’t as prevalent as it was in the Enjoy Life version, the crispiness is definitely throughout the entire bar. In other words, you take a bite…and it’s like biting into a Nestles Crunch bar all over again. But safe. And made with dark chocolate. Oh…and I should mention that this dark chocolate bar is vegan as well. The Dark Chocolate Dream Rice Crunch chocolate bars are made with simple ingredients which include all of the following: evaporated cane juice, unsweetened chocolate, cocoa butter, roasted soy flour, puffed wild rice, soy lecithin, pure vanilla extract. No fake chemicals, no preservatives, nothing that you need to look up in order to figure out what it is you are eating exactly. Nothing like that. Everything is pure and real. Real food…real chocolate. I love it already. As for nutrition…well…I remind you that this is a chocolate bar. So, do mind your servings. For me, I take one square with me to work, which equals out to 60 calories and 4 grams of fat. That’s not bad for one square of chocolate. But, the serving size for this treat is usually half of the chocolate bar. This serving will provide you with 240 calories and 14 grams of fat. The serving only kicks in 15 mg of sodium, which isn’t bad. However, remember…this is a treat and this is a sweet…and chocolate is still high in sugars. 1/2 of the bar will give you a huge dose of 23 grams of sugar. Aside from that, you will be provided with 1 gram of fiber and 3 grams of protein. But…the flavor. The flavor is what does it. I love to savor my chocolate. A nibble here…another there. And that’s the way I eat this one. The dark chocolate has that bittersweet flavor to it…which is amazing and delicious. I love how it melts against my tongue, and that hit of dark chocolate just lingers…and then, as I bite into it…the crunch from the puffed rice. It’s one of the best things in the world, which is why I think Nestles Crunch bars sell so well. Crunchy, smooth, rich, dark…it’s the best of everything. And I for one love every tasty bite. Not all chocolate bars are created equal. And not all chocolate bars are gluten-free. Thanks to Dark Chocolate Dream…I can still eat a Rice Crunch bar and savor it with the even more flavorful taste of dark chocolate. Well done!! 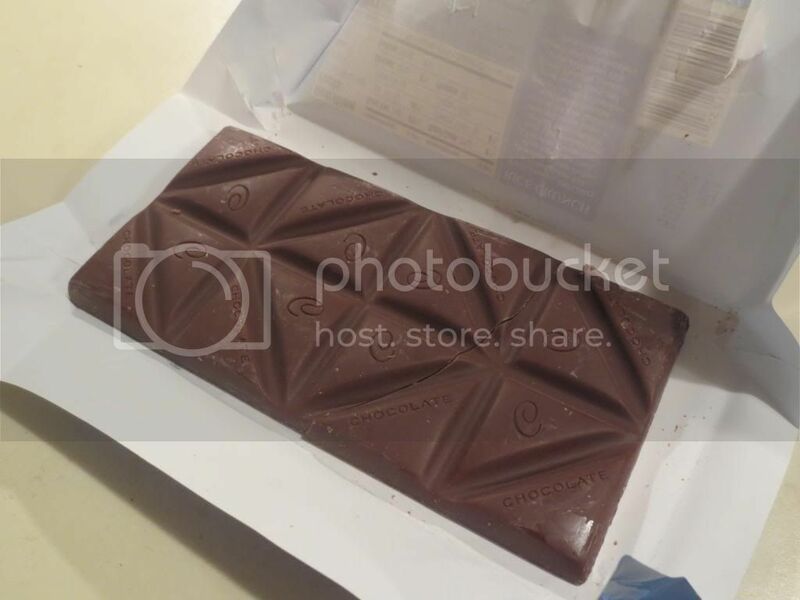 This entry was posted in Candy, Chocolate, Clean Eating, Dessert, Food, Gluten-Free, Products, Review, Rice, Snacks, Sweet Stuff, Vegan, Vegetarian by The Celiathlete. Bookmark the permalink. I’m not sure…but I’m going to go see if it mentions anything on the Web site. Thanks. Thank you, it’s always good to find a source of fair trade chocolate!